CALGARY, Canada, September 12, 2018 /3BL Media/ – Benevity, Inc., the global leader in corporate social responsibility (CSR) and employee engagement software, today announced three emerging trends likely to impact charitable giving during the biggest giving months of the year: September through December, when 50% of all donations are typically made to charities and nonprofits. Following a year that saw seismic shifts in giving, Benevity’s data suggests that 2018’s ‘giving season’ will see companies taking more innovative, people-driven approaches to their corporate Goodness programs. These approaches are shaping a new direction for how corporations engage their people in giving back and will help them foster compelling, purpose-driven workplace cultures while maximizing their social impact. Responsive. 2X the number of companies are running relief appeals for their employees—user-centric technology enables companies to be more responsive to social issues, tragedies and timely events, in addition to natural disasters. Democratized. 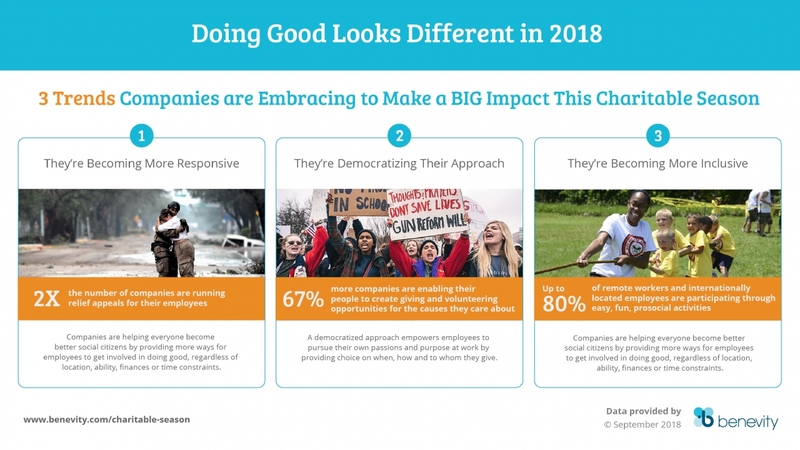 67% more companies are enabling their people to create giving and volunteering opportunities for the causes they care about the most—the biggest shift we’ve seen this year. Inclusive. Up to 80% of remote workers and internationally located employees are participating through easy, fun, prosocial activities—a significant increase over average remote worker participation in traditional giving and volunteering campaigns. Last year, charitable giving in North America crossed the $400 billion mark for the first time. But despite that seemingly huge number, most people aren’t aligning their actions with their ambitions when it comes to giving back. For example, Americans are only giving half of their intended donations—about 3 percent of their annual income. These new giving trends highlight proven ways that companies can help close the gap between actual and intended giving, boost employee engagement and make even more impact toward the causes we all care about. What follows are some real-world examples of how companies are changing their approaches to doing well by doing good. Benevity, Inc., a certified B Corporation, is the global leader in online workplace giving, matching, volunteering and community investment software. Many of the world’s most iconic brands rely on Benevity’s award-winning cloud solutions to power corporate “Goodness” programs that attract, retain and engage today’s diverse workforce by connecting people to the causes that matter to them. With software that is available in 17 languages, to more than four million users around the world, Benevity has processed over 2 billion dollars in donations and 10 million hours of volunteering time this year to almost 150,000 charities worldwide.